I'm just looking for ideas. Doesnt matter much what spindle you used...I just want to see the approach taken and if you have anything to say, go right ahead. 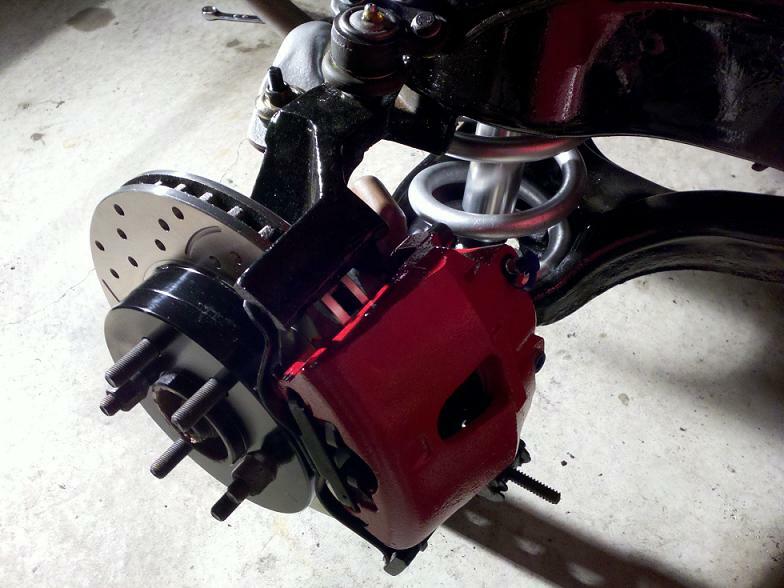 Just a 360 x 36mm rotor, billet steel hub, Brembo caliper and made my own caliper brackets. Fits behind my 18" wheels. I scored a set of brackets to put viper calipers on the rear. 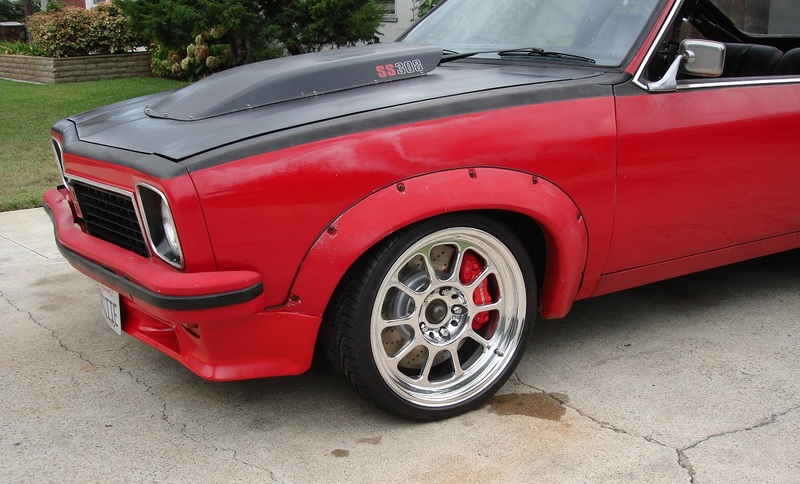 But I wont be able to fit them on the front without spacing the wheels I have found. I wont do that. So I am looking at a few sets of 4 piston calipers that will clear my 17 inch wheels. At this point the brackets are what I like to see. Thanks for those pics. Seems pretty simple and straightforward. I'll have a lot better picture when the calipers are in my hands for mockup. Here are the brackets I made... just used some 5/8" (from memory) thick plate steel. To figure out how I would get the angle and spacing between the two sets of holes (the caliper and the spindle) I just used a couple scrap pieces of aluminum and drilled some holes in them to bolt to the caliper/spindle and mocked the caliper up just where I wanted it, and used some screws to just hold it in position while I was testing it all out. Then I cut one out of thicker aluminum...with the holes in the correct spot and pretty much the shape I wanted. Used an assortment of washers to figure out how thick the overall design would have to be to center the caliper correctly. Then just got some steel and used the aluminum piece as a template for the outline and where to drill the holes. 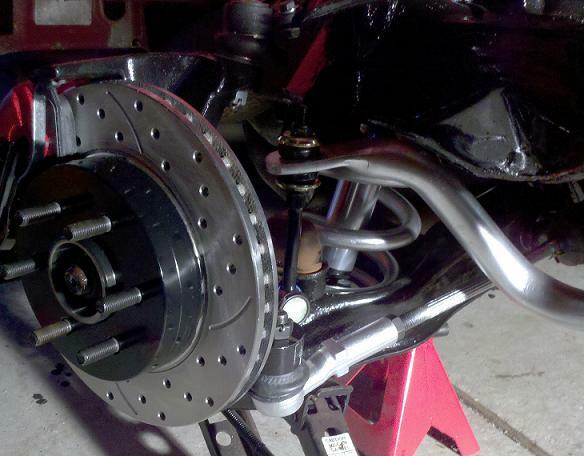 Ok, half inch plate and half inch spacers. That's exactly what I need to center the caliper on the rotor in my case as well. 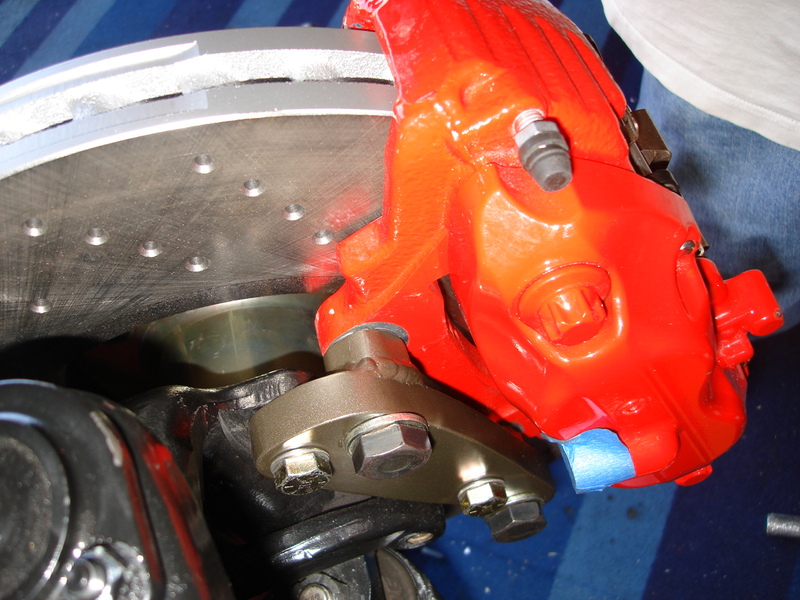 I only need to get the calipers in hand and do just the same as you and get the proper position in relation to the rotor surface. The trick for getting the positioning is just what I was looking for. 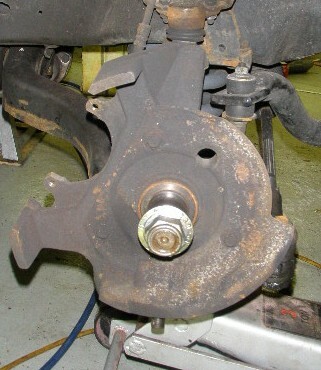 Soon as I get the calipers here I'll get the steel and get to work. the difference in braking from an 11.3 inch rotor to a 13 has got to be huge. That car has got to stop great! Mine is 5/8" thick stock....but what ever works best for you. are those daks 6 lug? are you keeping it? Yes, my dak is 6 lug. So the rear viper swap with the end brackets I have is a snap, but I get mixed info on the fronts. I've seen situations where I need a wheel spacer to accomodate the caliper in a 17 inch wheel on a dakota...I dont like that and it may not be a problem in reality with my new wheels since the outer rim is roomier and the spokes are out of the way. Likely wont be. But I'd also rather use my existing spindles too and not have to swap to newer ones. 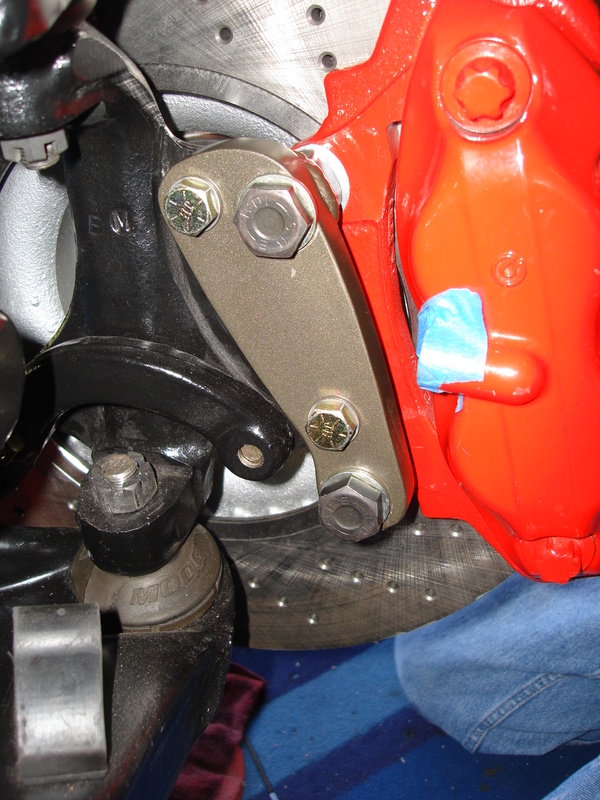 That would mean the caliper goes on the rear and that I will be cutting off those "guide bars" or whatever they're called to accomodate the larger caliper. They wont be needed though with a rigid mount and 4 pistons. Let me see if I can get a pic of my current state...wish me luck. Here's the type of spindle I'm working with...That's not mine BTW I just found the picture... Just sayin. So anyway those rear mounting points are what I am dealing with in my case. I am not changing to the late spindle. I am working with these. Mount center-to-center measurement is 4.5 inches IIRC (correct me if I'm wrong anyone), or about 114.3mm. I think that's the lug spacing too come to think of it. Hope I'm not confusing off the top of my head. So those are the confines of what I will be working within to make a bracket set for me and is what dictates the caliper I need. I need to do a little more research. I see places like wilwood have good detailed specs on their stuff which will help me choose a weapon. I could totally spare myself some work by going to the late model spindle indeed for which people make brackets, but I dont want the same thing everyone else has. The whole name of the game with my truck was to break all the "rules" and try different things. BTW Oz, Thanks for all the information and great pictures. You're always very helpful.